You will feel happy when you walk into this freshly renovated north corner condo. And, the view will take your breath away. The cheerful, tropical décor is also quite comfortable. The kitchen is top-of-the line with granite counter tops, stainless steel appliances, and custom cherry cabinets. Master bath has large walk-in shower. All of this an 1500 sf stretch out in. Free wireless internet service is included. We recently rented 2C at the Trillium for the week. It is a lovely condo. The kitchen is nicely stocked, the condo was exceptionally clean and the beds are comfortable. Although the weather was very hot that week setting records for September the AC worked perfectly even in both bedrooms. A closet was stocked with beach chairs, umbrella and a small cooler. The view from the patio was exceptional. Our only complaint was the work being done on the Hotel next door. They were loud and it went on all week even late unto the night some nights like 9pm. Hopefully that will be finished soon. We would definitely rent this condo again! We are so glad you enjoyed your time in this premier condo at The Trillium and were comfortable and able to "beat the heat!" We were not aware of the work taking place near you so we are sorry if we were not able to make you aware of this! Thank you for choosing to stay with us and we hope to have you back for a future visit!! EXCELLENT!!!! !Cant say enough. 2nd time staying here, will be back. Very nice condo - fully equipped kitchen. Master bedroom is very nice and roomy - very comfortable bed. Condo is nicely decorated and the view is awesome! Right on the beach! Will definitely return for another vacation!! 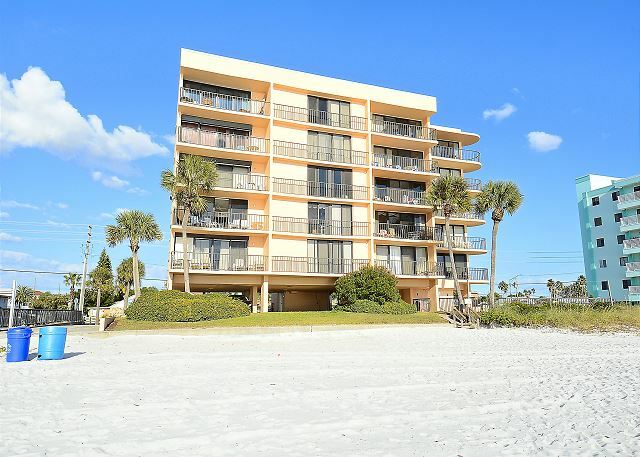 Great to hear, so glad you had a good stay in this premier condo on Madeira Beach!! :-) Thank you for being our guest and we hope to see you back for another visit soon! :-) Glad you enjoyed this premier condo in our program and we hope you will be back for another visit!! Look no further! This place is perfect. What a perfect combination of location and beauty. The condo and all seating inside faced the ocean. A beautiful remodel was done a few years ago and this created a lovely and comfortable floorplan. It is a very open space with quality furnishings and nice carpet. Everything you need is there-the kitchen was supplied amply. As other guests have said, we saw dolphins several days from our balcony. The balcony had plenty of chairs. There were also beach chairs and a cart available to haul things to the beach, along with some beach toys. This was perfect for us as we flew in. We plan to return to this condo on our next trip. The area has a lot to offer in all directions. The beach of course is pristine and just steps away. This was our favorite place we've found to stay in Florida so far and the one that we are anxious to get back to! This is so great!! This is a beautifully updated condo that falls into our premier category and we are so glad you love it!! :-) Thank you for being our guest and we look forward to your next visit to Madeira Beach for more amazing sunsets and dolphin watching!!! I have nothing but good things to say about our vacation at the Trillium 2c. From the check in process to the property itself, everything was taken care of and in great condition. This was our second year at this property and will probably stay again next year. Great to hear!! :-) We are so glad that everything has been to your liking and we hope to see you back on Madeira Beach for another family vacation in the future! Awesome!! :-) Hope to have you back for another trip soon! The condo was exactly as described even down to the dolphins swimming by in the morning! It was close to several grocery stores and restaurants. Overall a good place to stay. Awesome, so glad you enjoyed it!! This Madeira Beach location really is an ideal spot and we are so happy you saw the dolphins, they are an amazing sighting!!!!! :-) Thank you for choosing to stay with us and we hope to have you back for another visit soon! Like a charm!! This condo was perfect for our needs. Clean, bright, nicely appointed and comfortable! The beach was directly downstairs and the water was only 50 yards away. Beautiful! We'd rent this condo again no question! As always, everything was just perfect. Could not ask for a better rental office and its staff. Could not have wished for better weather. So peaceful by the ocean! Thank you so much for this post and kind words about our staff, we greatly appreciate that!! :-) October is a GREAT month in FL weather wise.....not to mention the pricing is lower that time of the year and the beaches are less crowded! :-) Thank you for choosing to stay with us and we look forward to your next visit to our AWESOME beaches! There were a couple little issues with the room but not anything remotely close to be upset about. The room is beautiful and location great. Very tasteful decor in the condo. I accidentally broke the styrofoam cooler that was left for visitors to use but i replaced it with a new one. Looking forward to hopefully visit there again. Thank you so much for your post! We are glad you enjoyed your stay at the Trillium but do apologize for any issues that may have come up. No problem at all with the cooler but we sure do appreciate you taking the time to replace it for the next guests use! :-) We hope to have you back at our beaches again soon!! Condo 2c was updated and clean. The location was perfect for our family who wanted a quiet part of the beach. The pool is very small with only six chairs and was usually occupied by other guests. I have no negative comments to make about our unit or our stay. After looking at many options for the week of July 4th we chose Trillium 2C and I'm so glad we did! It was perfect! From the view, the fully stocked beautiful kitchen, the location, and everything that was provided. We live over the bridge in the Tampa area and this location made us feel like we were hours away from home. It was just what our family needed to relax. We will definitely be back! Cond was beautiful, very clean and up to date. Fully equipped kitchen. Had to ask for washcloths and they were promptly deliviered. Quiet building, great restaraunts close by as well as grocery stores. Rental office very helpful! Parking spaces are at odd a angles and can be "tricky" to get into, but covered parking is a plus. Busy Street on back side of condo - use caution when crossing street and use the crosswalks. Candy Kitchen is the best! The unit was spacious and clean. It was tastefully decorated and had quality cookware/glasses, etc. I would definitely recommend this unit and will stay in this same unit for my next visit. I am very impressed with this place. It was really clean. I have stayed other places and I feel this is the best I've ever had. It had a closet full of beach things, fans, the kitchen pans were nice and not worn out. The whole place was very nice. The building was quiet at night. The kids bedroom let in a lot of street noise, but the large box fan took care of that and the kids slept in every morning. It was a short walk on the beach to get to the water. This was my family's first trip to the Gulf Coast, typically going to the East coast of Florida for a beach vacation. That will never happen again! This property was exactly what we were looking for! There isn't enough words t describe my satisfaction with the entire process of renting this unit, the overall accommodations, the area, the view, all was truly amazing. We love the location of the condo. The issue with lack of ventilation in the elevator and lobby area made for an uncomfortable experience when using them. Lock on the lobby door caused frustration because it did not consistently work and we had to go around to front entrance to get in. After searching/submitting numerous requests for condo's on VRBO with slow turn around & headaches, we finally found Resort Rentals and were very happy they/owner would work with our mid week arrival. They were easy to work with and answered any questions we had. The condo had just been remodeled and was VERY CLEAN and BEAUTIFUL. Flying in from out of town, it was nice they had some beach toys/umbrellas & chairs for us to use. Covered parking was very nice as was the fact the building wasn't crammed in with another condo building right next door. Grocery shopping and Walmart close by. This area much quieter than further south( Thunderbird area)but that was fine with us. Each condo is individually owned and I know WE will request this exact one next time we're in the area. 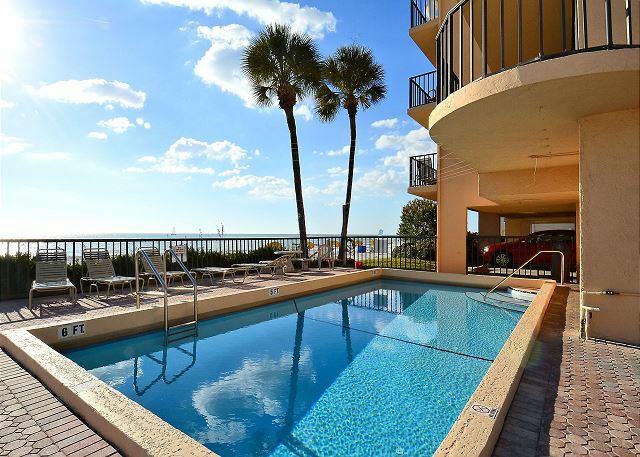 Cleanest, most updated, fully furnished condo on the gulf! 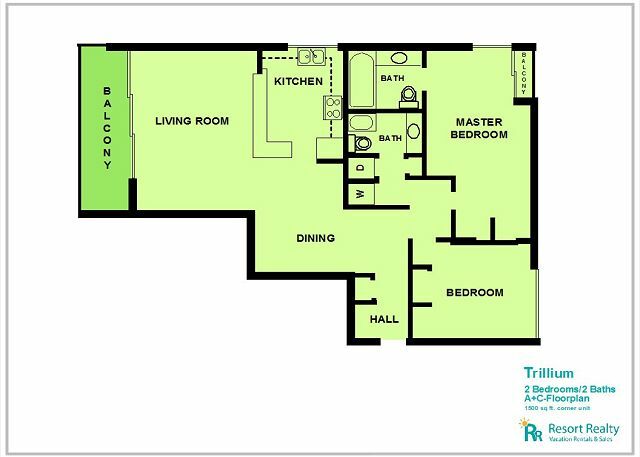 Trillium #2C is an awesome condo! Clean, updated, fully furnished, huge...I could go on and on. This unit boasts high end furnishings and appliances. The building is secured. I'm very particular about my beach condos (just ask my husband) but this unit was above and beyond my expectations. The building itself is older, but you won't notice. Our stay was very quiet and relaxing. Pool is a tad small and could use some shade umbrellas, but that's really my only suggestion. Management company was very helpful, quick, and efficient...and gave us a free insulated bag which we took to the beach every day. Most parking is under the building and in the shade. The location is within walking distance to Bula coffee shop and Dockside Dave's...yum! Quick trip down the road to all John's Pass has to offer. Would highly recommend Trillium #2C!! We were very satisfied with the rental unit and the area. We would recommend it to others and will consider a return visit. The property and amenities were top notch. We would be reluctant to shop for a different condo. Owner goes beyond expectations on maintaining the condo in up-to-date condition. Grocery store and great nearby restaurants. Great trip. Lots of fun in the sun. We had a wonderful time again this summer. We will come back! The air conditioner in the master bedroom really needs some work. Every year it is significantly warmer in that room compared to every other room in the condo. We are glad you enjoyed your stay. We have looked into the air conditioner issue and have replaced the entire system. You will be nice and cool next year! Lovely location, beautiful beach and relaxing respite. Condo was exceptionally clean, quality utensils and appliances. Everything you need and extras for the beach for guest use. Very happy and we have been traveling to Madeira Beach for 20 plus years. Only concern was age of building which left some mustiness and affected allergies. Other inconvenience was inflexibility with length of stay. Rigid about Sat. to Sat. which is frustrating when we travel so far and need to leave on a Friday. Thanks for your review. Great to hear you enjoyed the condo during your stay. I will pass on your comment concerning the building upkeep to the Condo Association so they can look into the matter. Sorry about the Saturday to Saturday requirement. Fortunately this is only required during peak times of year. If you are flexible with your time frame we can definitely accommodate you for more than 1 week! Thanks again and we hope to see you next year! *****UPDATE***** The hallways at the Trillium have all been updated with fresh paint and new carpeting! Great quiet place, beautiful beach and sunsets! Beautiful condo with stunning views from comfortable den/living room and kitchen! We had a difficult time getting the door to the unit opened, called the property mgr. Property mgr was very polite and helpful but they sent someone out 1 day later than planned. We still had trouble with the lock. That is our only negative comment on the condo. The kitchen was fabulous and was stocked with everything we needed. We all took turns using the master bathroom shower - it is beautiful. We saw dolphins multiple times a day. The water, beach, weather, and seafood were fabulous. I have stayed at multiple condos in Madeira Beach, and this is by far the nicest! Had a great time. Weather could have been warmer! Loved the area! It was like having our own home on the beach. The colors were my favorite-the layout great. A relaxing quiet family atmosphere was fantastic. The beach was only about 40 steps away and the pool was lovely. We enjoyed ourselves so much we intend to spend two full weeks at the Trillium #2C next year!! and bring the family to rent another unit for a week. Very nice condo with great view. The AC had a problem and was fixed quickly. We always stay in the Trillium. We feel like we're in our home away from home. The owners that we have met are nice,the renters are good for the most part. Some of them don't like to obey the rules, they like to prop the entrance open, which I consider very dangerous. anyone can access the units anytime, or hide in the building. We have a small family reunion there once a year, we all love it. I always say thanks for sharing your beautiful florida home with us. Everything was absolutely perfect! We have now stayed in this facility 5 years and plan to return in the future as well. Trillium 2C again met our expectations of a great place to feel at home while on vacation at the beach. The condo owners really strive to keep this condo updated and to provide information about the area that is helpful. We really try to stay at the Trillium when vacationing in Madeira Beach. Great location. Right on the Beach! Great Balcony to view awesome sunsets. Updated unit. lots of space. Clean and well maintained. Condo is very nice, and view is amazing. Got some incredible pictures of the sun setting, and the palm tree next to the balcony gives it just the right touch. Love the kitchen and the master bath. The building is set very close to the road, though, and the neighborhood is just OK. The pool is quite small and when we went in late December quite cold (I don't think it is heated). Parking was easy when we first arrived and the building was relatively empty, but became a challenge once additional cars showed up (tight spaces). 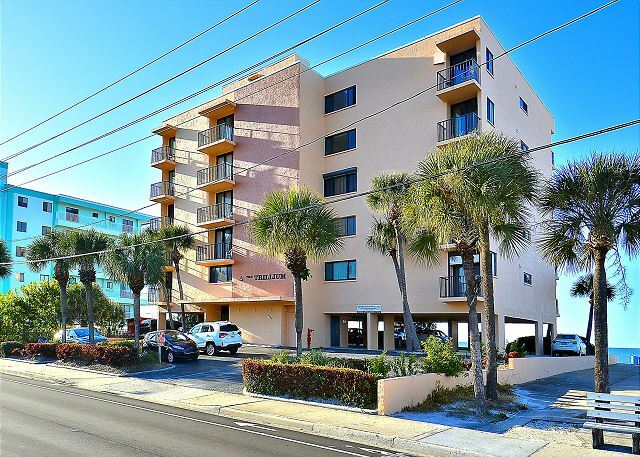 This was our first visit to Madeira Beach, and we found it convenient to drive to both north (Clearwater Beach, Tarpon Springs, Dunedin) and south (Siesta Beach, St. Petersburg) locations. ******UPDATE****** Thanks to all the feedback from guest reviews a pool heater was installed the end of March 2013!!!! We enjoyed being back at the Trillium after a 2-year absence! The condo was great - loved the new living room furniture - and the weather was sunny and warm. 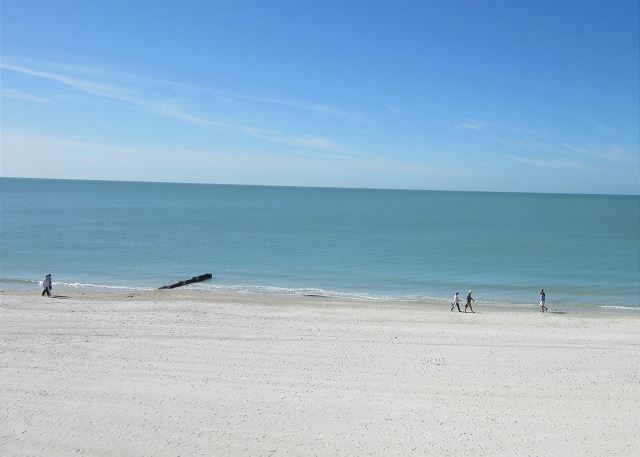 Madeira Beach is a wonderful vacation destination and we highly recommend the Trillium for a great "home away from home." In addition to the beautiful sunsets from your balcony, you can walk to many fine restaurants and shops via the beach or sidewalk. Thanks so much for your great review! I will advise the cleaning company about the carpet. In the future if anything is not up to par, please let us know. We have no problem revisiting a property to make things right! *** UPDATE*** The carpet is now sparkling clean!!! Thanks again for letting us know. It is constant feedback from our guests that allows us to continue to improve both our product and our services for the future. We love the Trillium! We visit at least once a year, more if we can. My whole family likes it down there, we now have a family trip every summer.We had four condo's this year. 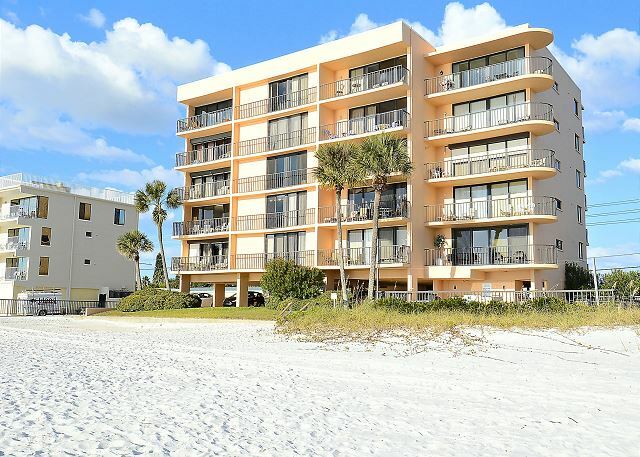 Great Condo Directly on the Beach. 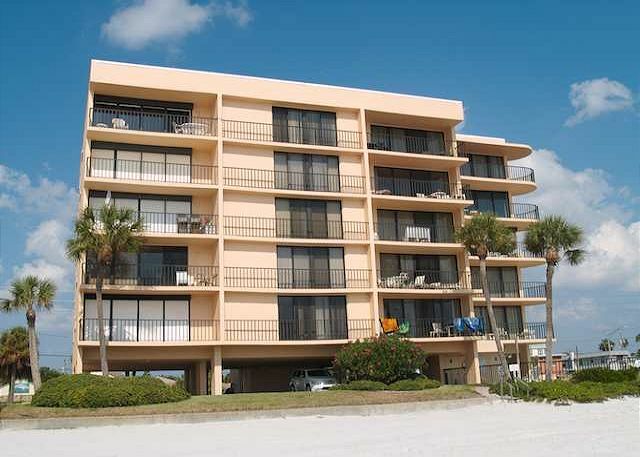 This is a well cared for and tastefully furnished condo in a great location on the beach. However the pool is extremely small and disappointing as were the hallways and lobby of the building. The parking lot is also very small and it was difficult getting in and out of our parking space. Loved the condo though and if you are not looking for a large pool area it's a great place to stay. Fabulous condo! Renovated & clean. Recommend that you bring paper towels & garbage bags (don't think this is mentioned). Had a great time, very nice property, well maintained, hope to return. Sea turtles nested on beach, dolphins & saw a baby manatee. 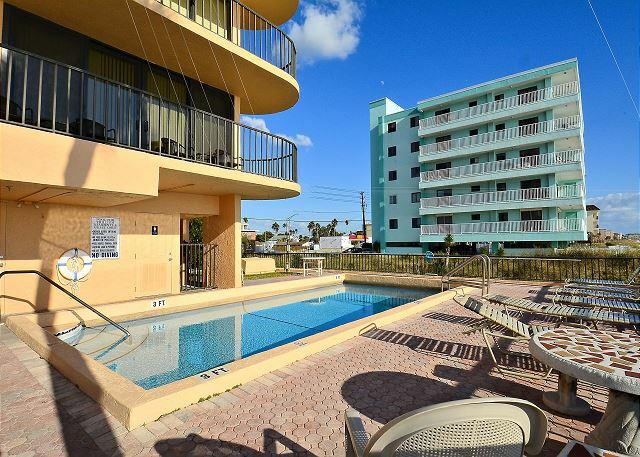 Small pool appeared to be clean (we never used it) balcony overlooking beach, quiet building. Nicely decorated condo, updated, lots of necessities available...Pots, pans, dishes. Loved it! We had a great time. The condo was wonderful, very spacious and modern. We had a very pleasant stay in the Trillum #2C. The property is right in the beach and is exactly what we were looking for in a vacation rental, proximity to the beach. The kitchen was very nice and the furniture comfortable. The master shower and bathroom were of nice size for a condominium. The carpet in the living area and master bedroom is in need of cleaning from extended use by guests. The condo was well stocked with dishes, appliances and silverware. The washer and dryer worked without any problems. Overall our stay was very enjoyable and memorable. Thanks for your review. I am glad to hear everything, withthe exception of the carpet was to your liking. I appreciate you letting us know and will have them cleaned as soon as possible. Thanks again! Much more spacious than anticipated. Immaculate, well-equipped, comfortable beyond words, gorgeous! We absolutely loved every minute there! Enjoyed watching the dolphins every day and the sunsets were amazing. The palm tree at the corner of the balcony was an added touch. Resort Rentals were great to deal with. Hope to return. As always, enjoyed the condo and its convenience and proximity to the beach. Look forward to returning every year. Every thing was excellent except the pool. The online picture is misleading and the pool is very small and not well kept. If you are a beach person and are not interested in the pool this property is and excellent choice for you. The interior upkeep is excellent but the exterior entrance and pool are not very good. Overall we enjoyed our stay very much. Thank you for your input.... I am happy to tell you that the Property Manager changed the Pool cleaning Company as of mid June 2011... We hope to see you back at the Trillium! The condo was very tastefully decorated and clean. Sunsets were fabulous. The management personnel were courteous, and professional. A well appointed appartment in a beautiful setting.We will return again. We were very pleased with everything....we were pleased with the size of the condo...we loved the open feel of the condo and the view was out of this world....We would come back again and hope to rent the same condo again! No complaints here! The condo is very clean and well kept. You can tell the owners take pride in it. 2C is a wonderful condo. 2C is a beautiful, renovated condo. The only slight issue is the air conditioning in the master bedroom. That room stayed warmer than the rest of the condo most of the time. Excellent place to stay on the beach. Beautiful view from the condo of the beach and the balcony with the palm tree at unit 2C is absolutely gorgeous. The rental agency is very helpful and courteous. The condo was beautiful, very clean and spacious. My paradise retreat!! !